‘Tis the season to travel! Our family travels pretty much every weekend (or so it seems) once football season starts so by the time the holidays roll around, we are seasoned veterans. Most of our trips are a few hour drives around Texas, but this year, David and I have been more of international travelers. We went to Zambia this summer (read about that here, here, and here) and we are currently en route to the Bahamas for our 5 year anniversary trip! 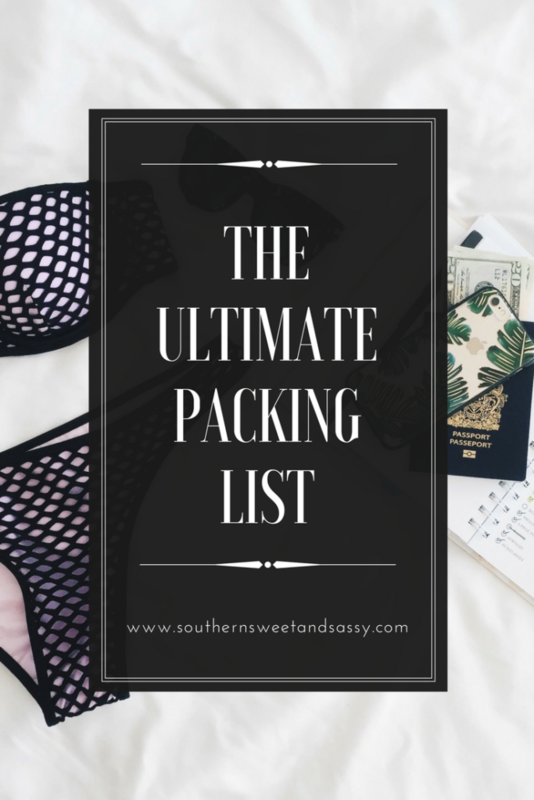 I am a list person and I feel like I am ALWAYS writing lists each trip we take. Sometimes I keep it on my phone, but most of the time, I write it out. I think it helps commit it to memory and sometimes it is faster for me to jot it down than try to type it out. 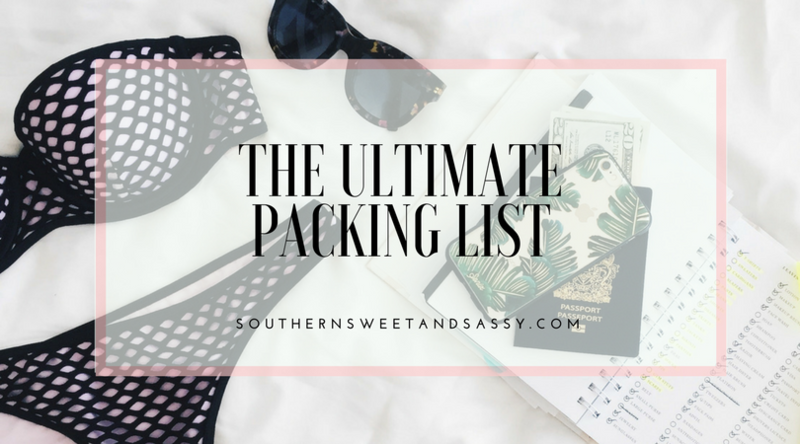 Obviously, I can’t help you choose what clothes to pack (my biggest challenge) but I can help with just about everything else! Cardigan or jacket – This is pretty obvious when you are traveling during the winter, but I tend to pack one when headed to the beach. Airplanes, hotels, restaurants and even the beach gets cold at night once the sun goes down. I picked this one up at Target the other day and it is lightweight and goes with just about anything. Robe – Great to have. I wear mine when getting ready so I don’t sweat/get makeup on my clothes for the day. This one is great for winter, but I love this one for every day! Undies/Socks – Don’t forget! My sister and I both forgot underwear on the same trip…that was interesting to say the least. Slippers – I packed mine and wore them on the plane from Dallas to Dubai and it made the flight just a little more bearable. Plus, you definitely DON’T want to wear just socks into the airplane bathroom on international flights. I made that mistake. Never again. Currently eyeing these! Dry Shampoo – I don’t go anywhere without this stuff. It cuts down on the amount of time I spend in the bathroom doing my hair on my trip and I can spend more time with family/exploring/sleeping, whatever! This one and this one are currently in my bag! Sunscreen – Whether you are headed to the beach or the ski slopes, it is so important to have sunscreen! Just make it a habit of keeping it packed in your toiletry bag and look for a daily moisturizer that has SPF in it. I LOVE this one. Moisturizer – I tend to cut down the amount of products I use when traveling but my daily moisturizer is so important! It is necessary to have – not only does it keep your face moisturized, it also helps you makeup apply evenly and smoothly! Makeup – I am a little high maintenance with my makeup but I try to cut it down to just the basics when traveling. I like to take 3 ShadowSense colors (Moca Java, Garnet, Onyx) to do different looks with and usually two LipSense colors to mix and match as I feel like it! Depending on the trip, I like to take a pair of falsies like these and the best lash glue for a more dramatic look! Makeup Remover Wipes – Even when you are absolutely exhausted and want to cut out all the little steps in your nighttime routine, please remove your makeup! I love using these wipes to remove… easy, simple and disposable. Contacts/Contacts Solution/Glasses – You never know when some sand/dust might fly in your eye. Charger/Back up battery – Great to keep in your purse for all times, let’s be real. Cheap Sunglasses – I don’t own an expensive pair of sunglasses because I don’t think it’s necessary. I always pick up a pair or two of cheap sunglasses at Target or Nordstrom Rack to wear on the beach! Hair Tie – I pretty much always have one around my wrist. This one is great!! Tote Bag – Great to carry on to the plane and keep your essentials. I love my Barrington Gifts tote and I have received SO many compliments on it. You can personalize which is great! Headphones – I bought these for the flight to Zambia and I use them all the time! SO great. My Little Steamer – I cannot go anywhere without this. So much easier than trying to set up an ironing board and iron and it goes way faster in my opinion. Fashion Emergency Kit – A little kit with lots of little things to help you look your best… lint removing sheets, fashion tape, shoe shine sponge, needle and thread, static guard, deodorant removing cloth… its just great to have period. Blankets – this is entertainment in our house, but great to have when going to sleep. Pack N Play – We have two and use them all the time. easy to set up and tear down! Rock N Play – If you are traveling with a baby, this takes up a lot more space, but it was our saving grace when the boys were little. They slept in this until they moved to their cribs and it makes bedtime in a new place so much easier. Pj’s – love Carter’s fleece ones during the cold nights! Extra Sets of Clothes – because life happens. Diapers/Wipes/Diaper Baggies – because (you know what) happens. Backpack – Diaper bag, easy to wear. When flying, split up all of your party’s clothing in each suitcase you are going to check with the airlines. That way, if for some reason one of your bags its lost in transit, you still have some clothes to get you through! Travel comfy! You are not going to be comfortable in 5 inch heels and a mini skirt. Wear shoes suitable for walking yet easy to remove (and put back on) going through security, and take layers. If you are going to be gone for more than a weekend, be sure you stop your mail with the postal service. It takes 2 minutes and you can get all of your collected mail delivered to your address (most cases) the day after you get back home. Let a trustworthy neighbor know you are gone – that way they can keep an eye out just in case they see something suspicious! **please note there are affiliate links within this post which means I may receive a small commission if you make a purchase with no additional cost to you. Thank you for supporting me and my blog!